How Does the LSM Measure Lake Water Quality? There are many imminent threats to Maine lakes. Near the top of the list, and perhaps the most pervasive, is the potential for lakes to become nutrient enriched and more biologically productive as a result of development in lake watersheds. This condition is characterized by declining water clarity (transparency), resulting from an increase in the growth of algae. Excess algae in lake water can cause a disturbance to the normal equilibrium of the aquatic ecosystem. As algae die and decompose, bacteria consume oxygen that is dissolved in the water. Increased algal growth can lead to a decline in oxygen levels, especially during the warm summer months. Oxygen loss can reduce critical habitat for coldwater fish (trout and salmon), and it can accelerate the decline of water quality. The enrichment of lakes with the nutrient phosphorus and excess algae, resulting from watershed development, is referred to as “cultural eutrophication” (CE). Stormwater runoff from disturbed or developed areas of lake watersheds typically carry high concentrations of phosphorus, sediment particles, and other pollutants considerable distances, eventually flowing into a lake. Lake watershed boundaries may be situated close to the shoreline, or they may extend for miles away from the lake. In either case, stormwater runoff from developed areas of lake watersheds is a potential threat to water quality, unless conservation practices are in place to control stormwater runoff. For this reason, the primary focus of volunteer water quality monitoring is the collection of information related to changes in lake biological productivity over time. Water quality data gathered by volunteers can be used to determine whether individual lakes are becoming more productive, less productive, or are stable. Many years of data are generally required to make these determinations with confidence. To learn more about becoming a volunteer water quality monitor, visit our Training & Certification page. 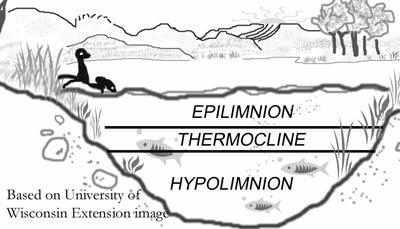 One simple method of assessing the effect of cultural eutrophication in lakes is to measure the concentration of planktonic (suspended) algae in the water. Algae are at the base of the lake ecosystem food web. Volunteer water quality monitors begin monitoring their lake by measuring Secchi disk transparency. 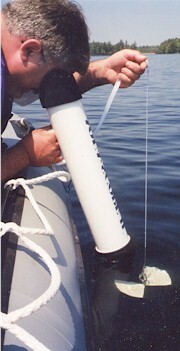 The Secchi disk is a simple device that is used to estimate algal concentrations, based on water clarity. Volunteers in the LSM are provided with a viewing scope and a Secchi disk that is attached to a calibrated line. They are instructed on the procedure for taking a Secchi disk reading by training staff. Ideally, readings should be taken a minimum of twice monthly from May through September or October. This frequency is optimum for identifying water quality trends over time. Readings are generally taken at the deepest point in a lake. 2) to identify and track long-term water quality trends. Secchi disk transparency is an indirect water quality indicator, because an assumption is made that water clarity is affected primarily by algal growth in the water. That assumption is reasonable in most cases. However, other factors may influence transparency, including the amount of sediment that is suspended in the water, and natural water color. Natural color and suspended sediments vary widely from one lake to another. Color is influenced by the concentration of natural dissolved organic substances in the water. These “humic acids” can stain the water in some lakes to the point where light penetration into the water column is substantially attenuated. Shallow lakes may be subject to moderate concentrations of re-suspended bottom sediments in the water column, resulting from wind turbulence. Both color and sediment can limit the utility of Secchi transparency data as an indicator of biological productivity. 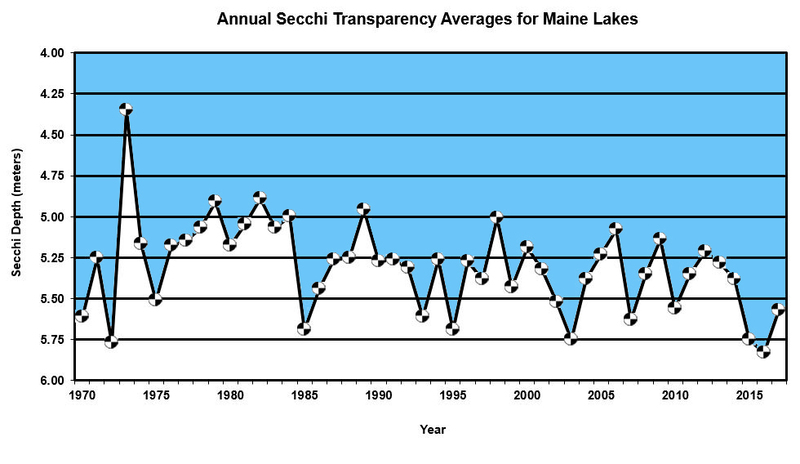 However, for most Maine lakes, Secchi transparency is a reliable and relatively accurate method for assessing water quality. The tiny plants (algae or phytoplankton) and animals (zooplankton) that are suspended in lake water influence transparency. These living aquatic communities undergo seasonal and annual growth cycles, resulting in changes in their overall density, and in their location in the water column. Secchi transparency is often at a low point soon after the ice melts in the spring. That is when lakes mix, or “turn over,” causing nutrients and sediments from the lake bottom to become suspended in the water for a period of time. 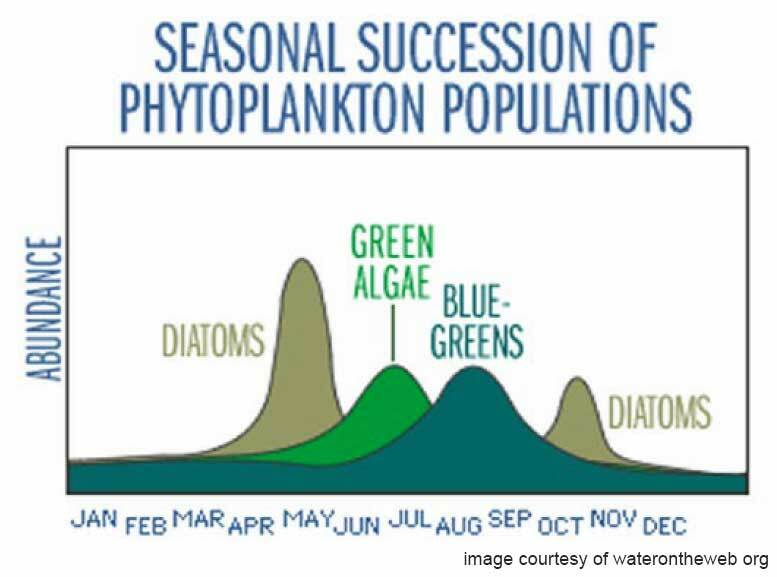 Silica that is swept up from the bottom sediments stimulates the growth of diatoms, a type of algae that experiences peak growth in the spring and fall (see diagram below). Diatom “blooms” often result in a brief period of reduced transparency in lakes. As the water warms and stabilizes during the summer, other types of algae will dominate the water column, depending on water temperature, nutrient levels and other factors. Some lakes become progressively less clear through the summer months, while others may become clearer. The concentration of phosphorus in the water, the shape and depth of the lake basin, the orientation of the basin to prevailing winds, and the weather all influence water clarity, or transparency. Individual lakes are unique in the way that they respond to these influences. Volunteer lake water quality monitors learn over time what is “normal” for the lake that they monitor. Many Secchi transparency readings are needed over a period of years in order to confidently detect and track trends in lake water quality. The natural variability of water clarity and other indicators of lake quality complicates the detection of trends, which is why many complete seasons of data are generally needed in order to be able to recognize a true change in water quality. Thus volunteers are asked to collect complete seasons of data from May through September—or later—each year. Another critical indicator of the health and quality of lakes and ponds is the concentration of oxygen that is dissolved in the water. Dissolved oxygen (DO) levels in lake water are influenced by many factors, including water temperature, the concentration of algae and other plants in the water, and the amount of nutrients and organic matter that flow into the water body from the watershed. Oxygen is produced through plant metabolism (photosynthesis), and it is consumed during respiration and decomposition. Oxygen in lake water is also influenced by wind and wave action through weather events and the exposure of surface water to atmospheric sources. An adequate supply of dissolved oxygen in lake water is essential to fish and other aquatic life forms. DO is also a sensitive indicator of change in water quality, and of the ability of a water body to support aquatic life. The loss, over time, of DO in the deep areas of a lake, especially during summer months, may indicate that the ecosystem is stressed and changing. Biological activity peaks in lakes and ponds during the warm weather months. It is also at this time that the phenomenon of thermal stratification (see Thermal Stratification at right) occurs. The combined influence of the two processes has a pronounced effect on water chemistry, and in particular on dissolved oxygen levels. The physical isolation of deep, cold water at the bottom of a lake from the surface water during summer stratification prevents the oxygen supply in the deeper water from being replenished. The period of isolation varies from one body of water to another, and depends on depth, and the influences of weather. Stratification may last from several weeks to a few months and it may exist only during warm, calm periods in shallower waterbodies. Some oxygen loss occurs naturally during the summer months as water temperatures rise, because the solubility of oxygen in water is inversely proportional to the water temperature. In other words, cold water is able to contain more oxygen than warm water (all other factors being held equal.) However, as lakes become more biologically productive, and organic matter accumulates in the system, the potential increases for oxygen levels to decline as the organic matter decomposes in deep, stratified areas. Oxygen depression or depletion can stress fish and other aquatic biota, and under certain circumstances, it can cause an acceleration in the decline of water quality. Volunteer monitors are trained to measure oxygen concentrations in the water using inexpensive chemical kits and a simple sampling device. This method is accurate and reliable, although somewhat time-consuming. The temperature of the water must also be recorded for each oxygen reading. A more costly, but time-saving alternative involves the use of a probe that is attached to an oxygen meter via a cable. The probe and meter simultaneously measure dissolved oxygen and water temperature, and the information is displayed on the meter. Oxygen concentrations and water temperature are generally recorded throughout the summer stratification period, from early spring through late summer and early fall, when DO levels are likely to be lowest in Maine lakes and ponds. Readings are generally taken from the water surface to the bottom of the deepest area of a lake, at one-meter intervals (depending on the individual water body.) Dissolved oxygen is measured in milligrams per liter (mg/L) or parts per million (ppm). Volunteer monitors are trained to collect total phosphorus samples from their lakes, using a simple process of obtaining a sample from a few inches below the water surface at the designated monitoring station. Total phosphorus analysis includes both organic and inorganic forms of the element that may be present in the water, in solution or in particulate form. Phosphorus is the nutrient that most influences the growth of algae in lakes. An increase in the concentration of total phosphorus in lake water generally indicates a potential increase in biological productivity (trophic state) of the system. Tracking in-lake phosphorus levels over time is another way of monitoring changes in lake water quality. 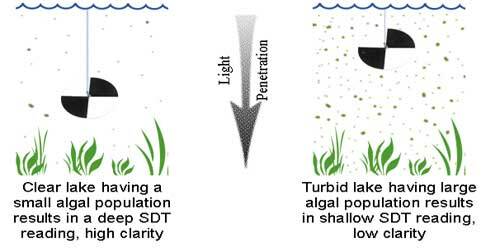 Combined with Secchi transparency readings, TP data provides additional information about lake ecosystem dynamics. Ideally, phosphorus samples should be taken from early summer through the end of the sampling season in September or October. However, the sample analysis involves laboratory fees, and volunteers are often limited to taking one or two samples during the late summer (about mid-August), when biological activity is at a peak. The LSM arranges to provide volunteer monitors with special sampling and laboratory mailing containers to facilitate the collection of phosphorus data. As is the case with most indicators of lake water quality, the concentration of phosphorus in lake water varies within individual seasons, and from one year to the next. Therefore it is important to collect multiple samples during the monitoring season, when possible.